As tough as times seem to be in the world economy, we always love to point out co-op gaming deals. The one deal though that can never be beat, is that of a free game. Today we bring you two free cooperative titles, courtesy of The-Best-Free-Games.com. The first game (pictured above) is called Warrior Epic. 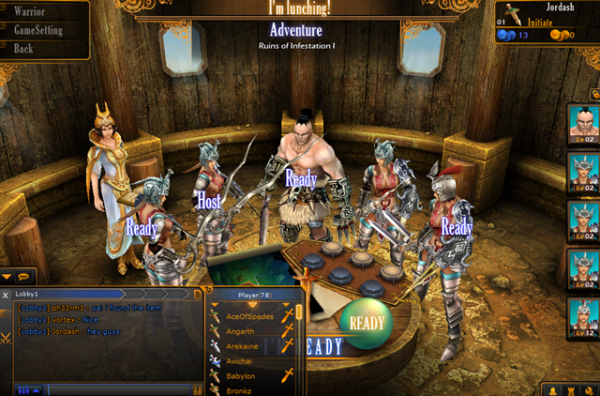 The game is a classic style action rpg where players can build characters and collect loot. Up to five friends can team up and complete missions by recruiting them to your barracks. Warrior Epic supports online and LAN play. The next game is another RPG, though it's a bit more of a Eastern flair. The game is called Lunia, and it's an eight player online RPG with giant boss battles and cooperative missions. Lunia also boasts a rich story told through artwork style cutscenes. Both these games are free to download and play, and both were rated very highly on The-Best-Free-Games.com. So if you're trapped inside this weekend because of some summer rain, perhaps it's time to gather some friends and give these a shot.